I used my wife’s advice and chose to create a Zazzle.com account. It didn’t take long at all and I was able to setup a front and back, long-sleeved, black t-shirt for the Threadless “No Bones About It” submission. I didn’t win on Threadless, but I can still have my designs printed should somebody want one. Unfortunately, they’re going to be more expensive this way. If you dig it, awesome! I think you can actually modify the parameters and get a cheaper, short-sleeved version printed too. Either way, it’s cool to have this outlet when the design fails at Threadless. If things go well, you should see a new design each month on my Zazzle account – or at until I win a competition and Threadless and am restricted to resell it elsewhere. Previous post: Where’s “My” Community? I actually want to buy one, even if I weren’t your mother (which I am). How do I access Zazzle and find your shirt? In case you hadn’t realized it yet, you can click the picture in this post to be linked to my zazzle.com store. I updated the post text to include that little nugget of information too! 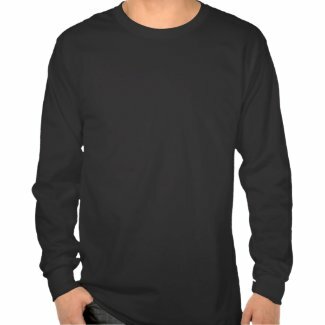 My favorite part about the zazzle store is you can “try” on this shirt in other colors on different models. I particularly like it on Mikel (the tough guy with the neck tattoos) in green. Gives the design even more “street cred”. Sup?